We fill our frozen food aisle with all your favorite products. 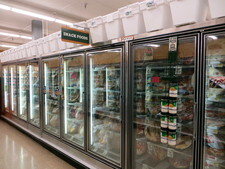 We carry a wide selection of frozen pizza, snacks, dinners, juices, ice cream products and more! Also check out our Gluten Free and Natural Items. We welcome any special requests for specialty items. If you can’t find what you’re looking for just ask a helpful associate.